With Easter coming up next week I thought I'd do a little salute to ham and all the yummy ways you can use up leftovers. First is to bake the ham itself. This photo shows a ham that I overcooked but it was still yummy and I was able to use it for several more meals. I basically put this half ham in a deep pan, covered it in foil, and baked it about three hours. Nothing special. I have had some marvelous ham over the years prepared by my excellent mom, aunt, and grandma but of course, don't know how they made it. 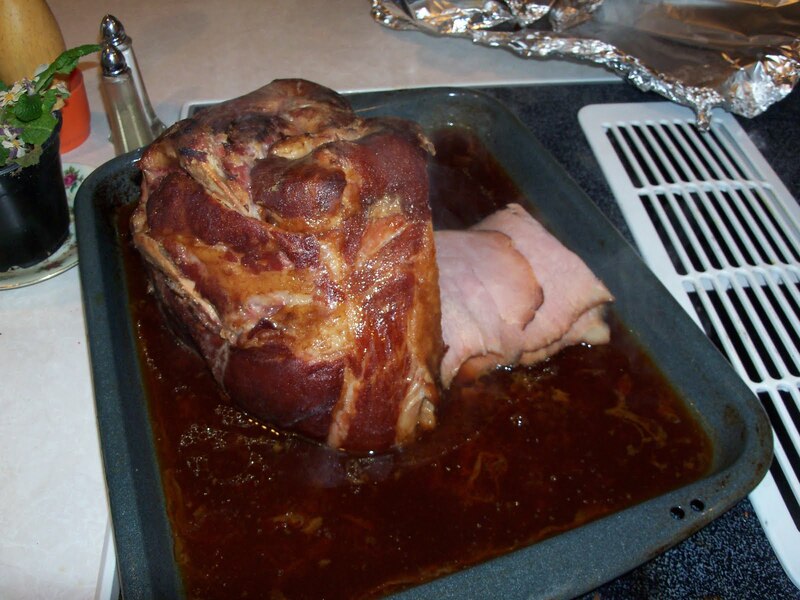 So I looked up some other ways to dress a ham: With cloves & brown sugar With pineapple, cloves, brown sugar, honey, & maple syrup With brown sugar, mustard, & peach preserves (you could also use apricot preserves) With a Coke I love allrecipes.com and these are all from that site. Thanks Brooke! I'm posting about both non-bone soup and with-bone soup later in the week, and a link to this recipe is included! Yum!